Born and raised in Long Island, NY, Rodney Freidank began his culinary career at the age 16 in a New York-style delicatessen. Several years later, he landed in Wilmington, NC, where after a couple of years at his family-owned Clubhouse Restaurant at The Cape Golf and Racquet Club, he apprenticed under Chef Pete Herring (CEC), developing his culinary style and appreciation for Carolina coastline seafood. A move to Greenville brought Rodney to The 858 Restaurant where he honed his skills, working his way up from line cook to Executive Chef in just a couple of years. In 1997, he moved to Soby’s New South Cuisine where he continued to impress with his work ethic and presentation of fresh, seasonal ingredients and bold flavors, earning himself the title of Certified Executive Chef from the American Culinary Federation in 2001. In 2010, Rodney was named Corporate Chef of Table 301. He plays an integral role in all of the company’s restaurant operations, including the opening of Nose Dive, the city’s first gastropub; Passerelle Bistro, a French-inspired bistro in the heart of Greenville’s Falls Park; Papi’s Tacos and the Highway 301 Food Truck. Rodney is also instrumental in bringing the best of Table 301 to The Masters in Augusta, GA, where he’s overseen the culinary needs of clients such as ESPN, The Double Eagle Club, PGA of America, and many others. Most recently, Rodney brought his talents to corporate clients at the PGA Championship in Charlotte, NC. 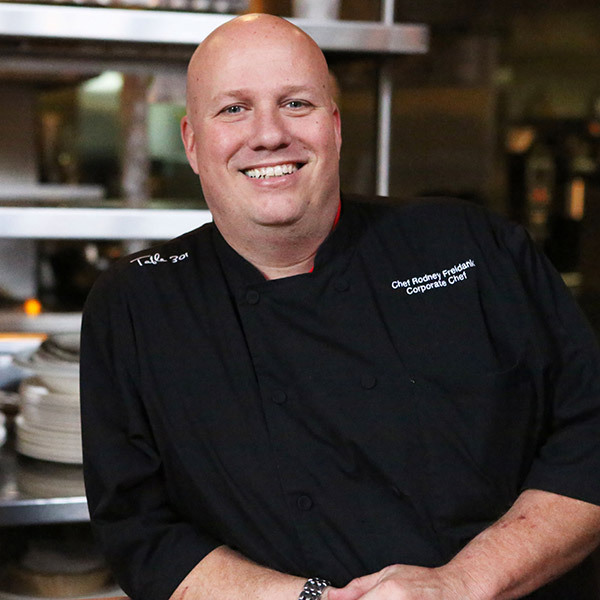 Since joining Table 301, Rodney has won numerous local culinary accolades, including South Carolina Hospitality Association’s “South Carolina Restaurant Manager of the Year” award, which recognizes individuals who go above and beyond normal job expectations both at, and away from work. He has been a featured chef at the prestigious James Beard House in New York City with the Soby’s team in 2000, and 2016, and co-authored the award-winning Soby’s New South Cuisine Cookbook, published in 2007 (second edition 2016). A frequent guest chef on local Greenville media, Rodney enjoys sharing his love of food and cooking with the community. In addition, he is a member of the organizing board for the city’s annual Fall for Greenville event and serves each year as a culinary judge for the South Carolina ProStart Invitational, the state’s premier competition for high school culinary arts and hospitality students. Rodney is also a certified instructor and proctor of Servsafe Food Protection Manager, and Servsafe Alcohol courses. You may have even seen him featured on an episode of Tastemade’s “The Grill Iron” in 2016. Rodney is married to Sarah Freidank, also a Table 301 associate, and is proud dad to sons Gabriel, Ryan, and daughter Abigail Joy.